Greg Williams leafs through the Scottish budget and finds fiscal opportunities for the next Scottish Labour leader. As the Scottish Labour leadership contest continues, we expect and need the candidates to outline the policies they would pursue as First Minister. However, such forethought is hazardous; a candidate with clear ideas risks being branded as fiscally profligate unless they can substantiate how such policies will be afforded. Fortunately, the publication of the Scottish Government’s draft budget for 2015-16 furnishes some options. Firstly, we can challenge the ‘nasty Westminster has left us with no money’ nationalist narrative. The Scottish Government (SG) is not as hard up as they’d have you believe. If you flick to the rear of the budget document, all the way back on page 181 in a presumably mandated table, we see that the total Scottish budget has increased from £35.4bn in 2014-15 to £37.4bn in 2015-16. That’s a cash terms increase of 5.7% – far above inflation (with CPI forecast at 2.0%). Part of that may be due to increased provision for pensions, so a more reliable indicator is to look at Defined Expenditure Limits, or DEL, in isolation. 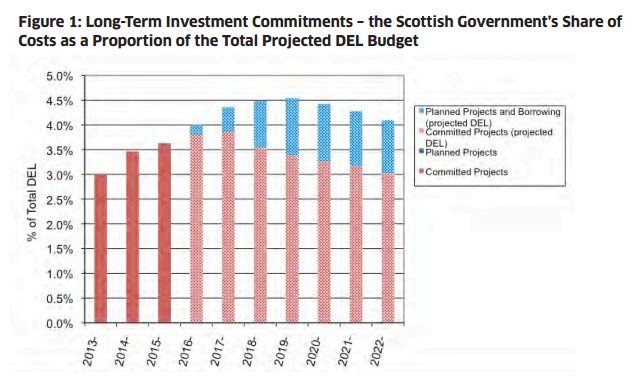 Again, hidden at the back of the budget document on page 173, we see that DEL is increasing by £700m in 2015-16, or 2.3%, in line with inflation. Clearly the SG is not all that hard done by. So revenue financed investment can’t be a bad thing if the SNP are doing it more and more, right? Perhaps not, as long as Labour can endure with humility applying the ‘lessons learned’ from the first generation of PFI deals. Additionally on this point, we should note the SG plan to ‘limit our future revenue commitments to a maximum of 5 per cent of our expected future annual DEL budget.’ So, with revenue finance forecast to account for 4.3% of DEL in 2021, any administration playing by the same 5% rule has an approximate £200m a year to allocate in revenue finance. That could pay for additional hospitals, schools, or other capital investment PFI/NPD repayments. Thirdly, we need to talk about council tax. Much has been written elsewhere on the benefits of a revaluation and/or the addition of a new, higher band at the top. When implemented in Wales, the measures raised an additional 4% in local government revenue. In the year 2012-13, £2bn of council tax was raised in Scotland, so a 4% increase would raise £80m of additional revenue for Scottish councils. This could free up for other uses the transfer to local government of £70m p.a. by which the SG ‘funds’ the council tax freeze. Fourthly: cuts. Our previous leader was pilloried by the nationalists for seeking to start a debate about the affordability of universal benefits. This was unfair. Johann Lamont was right to question whether the £200m a year spent on providing universal concessionary bus fares for example is the best use of taxpayer money, especially at a time when the SG claimed it couldn’t afford to find an extra £15m to fully mitigate the bedroom tax. £17.9m on ‘Europe and Historical Affairs’, up £2.4m on the previous year, allocated to ‘increase the level and frequency of Scottish engagement with EU institutions to advance our policy objectives.’ A Scottish Labour government would not need to spend such amounts slithering around the corridors of Brussels, lobbying for EU admission after independence. £3.6m for the Office of the Chief Scientific Advisor. That’s either a lot of science advice, or an expensive office. An additional £15m is being spent on ‘cultural collections’ in the arts budget next year. Could that money be found through admission fees for special exhibits? £10m p.a. for Prestwick airport – the ongoing, and no doubt escalating, price of a knee jerk nationalisation in order to win referendum votes on the west coast. We should be questioning what is the government doing owning and operating airports with only one scheduled airline. Labour could bite the bullet and close the passenger terminal. 2015-16 sees an increase of £2m to £5m p.a. on ‘strategic communications’ which ‘enables Scottish Ministers to engage with audiences in Scotland and across the world to support the delivery of the Scottish Government’s purpose and outcomes.’ A Scottish Labour First Minister would hopefully not suffer from the same pomposity affliction as the outgoing FM, and save money here. The enterprise budget increases from £445m to £490m next year. Within it, there is duplication of bodies such as Scottish Development International with UK Trade and Investments. Surely some funds can be liberated where there is overlap? I’ve also written about the inefficiency and ineffectiveness of Scottish Enterprise’s account management program here. £138m a year staff bill for central government administration, representing an army of civil servants engaged in constant constitutional wrangling and economic denial. Would a future Scottish Labour administration need so many bureaucrats? By implementing just half of these options, perhaps £25m p.a. could be liberated for other spending priorities. Fifthly, finally and flippantly, next year’s budget sees £25m allocated to Scotland Act implementation – in particular, setting up the rate of Scottish income tax. Why spend all that money establishing a power if you’re not going to use it? These are just some ideas which occurred to me going through the budget document. I know there are many other ideas out there, including those being debated in the Smith Commission. However these spending choices can be enacted now. They enable us to outline policy choices now, irrespective of constitutional evolution. They illustrate how, today, the SNP are making self-interested, just plain bad spending decisions to Scotland’s detriment. Our leadership candidates should be comfortable telling us which policies they would pursue as First Minister, even if they require spending money. Because with better, less nationalistic and less hubristic management of the nation’s finances, there is money available.